One of the best attractions in this wonderful Rocky Mountain park is the Jasper Tram, which transports customers above the treeline to the top of Whistlers Mountain. 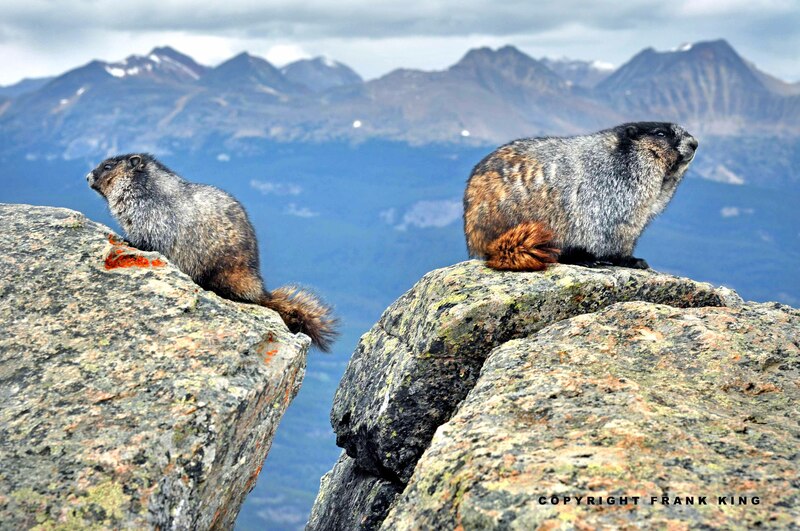 During a visit there in 2009, this pair of marmots – probably mother & baby – were beautifully posed on some boulders just a few minutes’ walk from the top of the tram. Scrambling, I quickly slapped on a 35-70 mm. zoom lens and skipped the tripod, because I never knew how long I had before the marmots disappeared. Great photo: the dof, the crispness of the animals, the composition! Thanks for the kind words. I’ve been to this spot twice since then and never saw a single marmot.